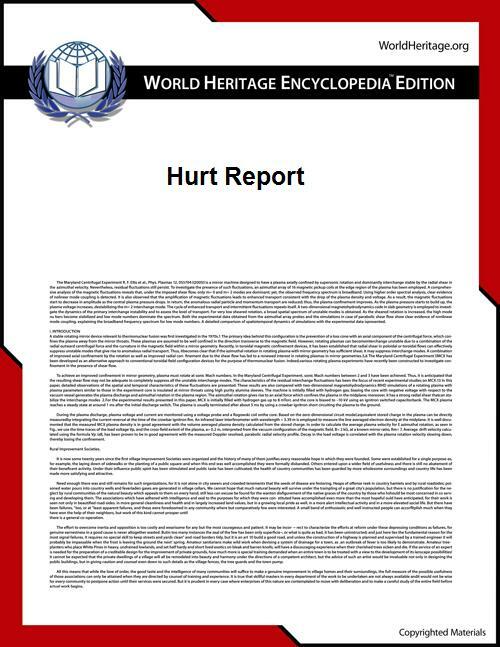 The Hurt Report was a motorcycle safety study conducted in the United States, initiated in 1976 and published in 1981. The report is named after its primary author, Professor Harry Hurt. Noted motorcycle journalist David L. Hough described the Hurt Report "the most comprehensive motorcycle safety study of the 20th century." The study was initiated by the Department of Transportation's National Highway Traffic Safety Administration, which contracted with the University of Southern California Traffic Safety Center — the work was ultimately conducted by USC professor Harry Hurt. The Hurt Report findings significantly advanced the state of knowledge of the causes of motorcycle accidents, in particular pointing out the widespread problem of car drivers failing to see an approaching motorcycle and precipitating a crash by violating the motorcyclist's right-of-way. The study also provided data clearly showing that helmets significantly reduce deaths and brain injuries without any increased risk of accident involvement or neck injury. 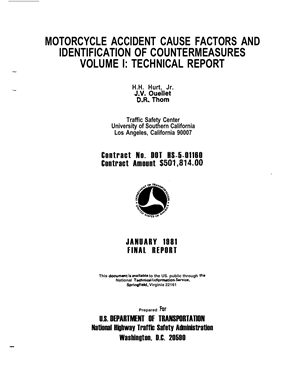 The full title of the report was Motorcycle Accident Cause Factors and Identification of Countermeasures, Volume 1: Technical Report. After retiring from USC in 1998, Hurt established and headed the Head Protection Research Laboratory (HPRL), of Paramount, CA. A 2007 motorcycle crash scene investigation in San Francisco. Professor Hurt, with a team of investigators (all of whom were motorcyclists themselves) examined motorcycle accident scenes in the City of Los Angeles, day and night, during the twenty-four-month period of 1976–77. They did on-scene investigations of over 900 accidents and studied 3,600 police reports from the area of each accident. Investigators later returned to 505 crash scenes at the same time of day, same day of the week and with the same environmental conditions to measure traffic volumes, photograph passing motorcycles and interview 2,310 riders who stopped to talk with investigators. This allowed the research team to compare accident-involved riders to riders in the same location who were not involved in a crash. The study took place throughout the City of Los Angeles including urban as well as rural conditions, e.g., incidents of motorcycles striking animals. Each accident was studied individually with approximately 1,000 data elements, collected for each of the 900 accident scenes, including measuring and photographing vehicle damage, skid marks, scrape marks, people marks, and interviewing survivors. Hundreds of accident-involved riders donated their helmet to the research, which allowed team members to disassemble, measure, photograph and record the accident damage as part of the study. The Hurt Report summarized accident findings related to motorcycle crashes into a 55-point list. Among the major points: two-thirds of motorcycle-car crashes occurred when the car driver failed to see the approaching motorcycle and violated the rider's right-of-way. The report also provided data showing clearly that helmets significantly reduce the risk of brain injury and death but with no increased risk of crash involvement or neck injury. When interviewed in 1999, Professor Hurt "confided that he believes the report is still basically valid." Between 1997 and 2008, motorcycle rider annual fatalities increased from 2,116 to 5,290 – a 150 percent jump, according to U.S. Department of Transportation’s Fatality Analysis Reporting System. In 2008 alone, deaths due to motorcycle crashes rose by an estimated 2.2 percent while all other vehicle classes saw reductions in fatalities. In David Hough's book Proficient Motorcycling, Dr. Hurt said he had always assumed a new study would be conducted. The 1999, the Organization for Economic Co-operation and Development (OECD) standards, and studying 921 accidents as well as exposure data on an additional 923 cases from five locations in France, Germany, Netherlands, Spain and Italy. ^ a b c d e f g h i j "Interview With Harry Hurt". Soundrider.com. ^ a b "National Agenda for Motorcycle Safety". ^ a b c d "Oklahoma State University to partner with Federal Highway Administration on major study into causes of motorcycle crashes". Oklahoma State University. 5 October 2009. ^ """AMA "Fuels the Fund. w2trokebuzz.com, January 9, 2007. Even Dr. Harry Hurt, interviewed in 2000 for David L. Hough’s fantatsic and essential book “Proficient Motorcycling,” seemed amazed that a more comprehensive study has never come along to replace it. Finally, in 2005, Congress approved a new motorcycle crash study, budgeting $2.8 million, with the stipulation that manufacturers, organizations, and motorcyclists would need to raise an additional $2.8 million. ^ Carpenter, Susan (2007-07-11). "A fresh look at bike safety: With more riders on the road, experts plan a new study on the causes of motorcycle accidents". Los Angeles Times; Throttle Jockey. It's about time. After 26 years, a major new motorcycle crash study is poised to begin. [...] Even so, it wasn't until 2005 that the federal government decided to fund a new motorcycle crash causation study. A federal transportation reauthorization bill (a.k.a. SAFETEA-LU) included $2.1 million for the research, with the caveat that federal funds be matched from a nongovernmental source. [...] Until last month, the Motorcycle Safety Foundation was averse to helping pay for it, fearing the study would be underfunded and would use statistically insignificant samples of motorcycle crashes. The foundation agreed to throw in $2.8 million, 33% more than federally required, but only after extensive lobbying for more government money, which hasn't come through. ^ Carpenter, Susan (2009-03-01). "U.S. motorcycle crash study stalls: MAIDS 2.0 may have to suffice". Los Angeles Times Blogs; Up To Speed The latest autos news, tips and trends. Archived from the original on 2009-05-04. Retrieved February 14, 2014. The long-awaited follow-up to the 1981 Hurt Study is short at least $2 million, and it's unclear whether that funding will come through any time soon. Or ever. ^ a b c "Why the surge in motorcycle deaths? Federally funded L.A. study seeks answers". The LA Times, October 14, 2009. October 14, 2009. ^ "Upcoming Federal Motorcycle Crash Study validity now severely questioned". Sport Rider, October 2009. Consistent with its stated provisions, the Motorcycle Safety Foundation withdrew support of the abbreviated study, saying such a study would be "unlikely to either validate the findings of prior studies or establish, to any statistical significant level, any new causative factors. The abbreviated study would be unlikely to accomplish either of these goals because the sample size is expected to be only 300 crashes, compared to the 900 crashes collected and analyzed in the Hurt Study, 921 in the MAID's Study (Europe 2000) and the 1,200 recommended by the National Transportation Safety Board." In 2009, the Federal Highway Administration and Oklahoma State University's Oklahoma Transportation Center began conducting an 'abbreviated' Motorcycle Crash Causation Study with 300 case studies "to help identify common factors – including road configurations, environmental conditions and rider experience" and "how these factors may be affected by countermeasures that, if effectively implemented, will prevent motorcycle crashes or lessen the harm when they occur."